You might not be keen on tweeting about Whole Foods promotional offers, but if those tweets meant immediate, substantial savings, you just might. That’s what American Express is banking on with their newly launched, “Tweet your way to savings” program, which allows cardholders to tweet a promotion and reap immediate benefits when the purchase is made. Here’s how it works: First, (obviously) you have to be an AmEx cardholder and have a Twitter account. You sync your card and Twitter account, then just tweet any of the current hashtag offers to receive savings that are automatically applied as statement credits on your account. There are no promo codes, coupons and printouts needed. 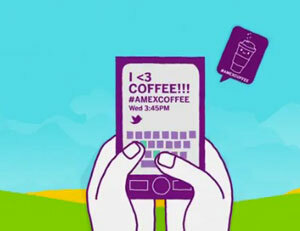 So, for instance, you can tweet #AmExZappos and get $10 off a Zappos purchase of $75 or more. Offers with McDonald's, Whole Foods, Best Buy, Dell, H&M and a handful of others are now running, with plenty more to come with national retailers of all sorts.Some offer meaty savings, others only five or ten bucks, but theyre worth the time it takes to type 140 characters (provided you don’t mind using Twitter to shill for American Express and partners). I expect some will shill for a few shillings. They are easily bought. I will immediately removed them from my twitter feed. I think people who wear clothing with exposed oversized logos should be paid as walking bill boards. I will promote my local artists and local small businesses only. I can see using it only with the vendors that I love and already endorse by word of mouth, and that I use regularly. If I already recommend them, why not get a little money for it. But, I would probably be limited to one or two vendors on the list and would not use a sponsored tweet more than once a day. Has Twitter and “tweets” really become that valuable of a marketing medium? Amazing. I guess so or Amex would not be doing it. I think it only works that way when you have someone famous or welk-known in that specific industry plug your product. So, wouldnt that be like them paying a spondor? Would love to “hear” what Techlicious readers have to say. Is weakening your brand worth a few shillings? Perhaps this is worth it for people who tweet just to let others know what they had for breakfast. For people who work to strengthen their brand and develop loyal followers, I somehow doubt if the dilution that would inevitably occur is worth it. At minimum, one would have to very carefully select only those offers that are, in some way, congruent with one’s brand. I suspect a number of people will simply set up secondary, dummy Twitter accounts solely for the purpose of getting the Amex discounts. NO. Just use twitter for stupid abreviated statements, as it was intended. PLEASE don’t turn everything into money-making activities that add more confusion and few $$. Reminds me of extreme couponing. This is going way to far! NOt to mention that there will end up with a bunch of dummy accounts, the possibilities of having your Credit Card synched will make the possibilities for it to become compromised easier. Identity theft will also become an issue! The whole thing is not Corporately being Responsible. It is a shame that AMEX is choosing this route. Definitely closing my AMEX card and cutting this one up! I’m disabled and living on a fixed income. If tweeting would mean some extra money in my pocket, I’d do it. Why not? I’m not hurting anyone and if you don’t want to read my tweet no one is forcing you. If I had an Amex card, I wouldn’t mind! Of course, I don’t have any followers, so I don’t know what good my tweets would serve Amex, and the whole argument is moot since I don’t have that card.